Dreaming of the relaxation, enjoyment, and fun of having hot tub in your own backyard, but don’t want the hassle (or price) of a big permanent fixture? You’ll need to check out these best inflatable hot tubs of 2019. There are a few things you should consider when making your purchase and we’ll show you what’s most important – click to see our Inflatable Hot Tub Buying Guide, or continue on for our top picks for this year. By the time you’re done reading, we’re sure you’ll have found an inflatable hot tub that’s just right for you. Size, Inflated: 77″ dia, 28″ deep. 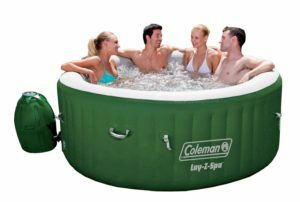 If you’re looking for an all around great inflatable hot tub for your backyard at a price that knocks the socks off of the permanent hot tubs, I’d highly recommend you look at this Coleman SaluSpa. It’s my top choice for this year. 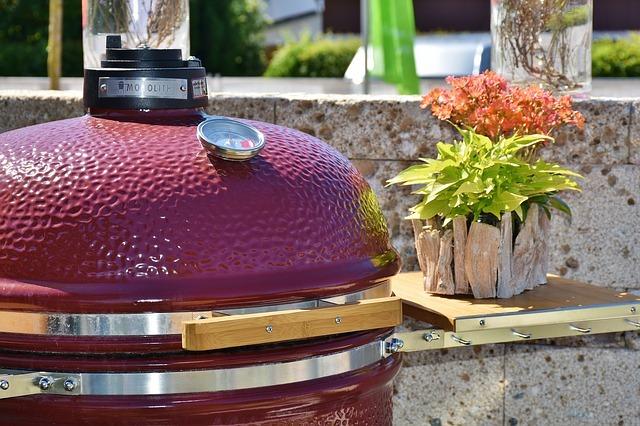 Coleman products are consistently good quality, and you can be sure this one is as well. You’ll love the soft air bed floor to sit on and the comfortable Tri-Tech walls for leaning against (apparently it’s so comfortable that you won’t even miss the carved seats of the hard models). The walls are also firm enough to sit on the edge, if you just want to dip your toes in! The air bubbles are fantastic! They feel like jets and work really well to give you that spa / Jacuzzi feeling. You also get a thick thermal mat for beneath the tub, which both insulates and protects the tub from sharp debris on the ground. The tub inflates in just minutes using the included spa pump! Although it is a simple setup process, if you get stuck with the installation, apparently YouTube has some excellent videos to help you along. It has a digital control panel that allows you to get the exact temperature that you desire, to a maximum of 104 degrees (industry max). Just a brief heads up for those of you who are thinking this might be the perfect inflatable hot tub for your cottage: There’s an automatic shut-off that occurs after 72 hours of non-use. 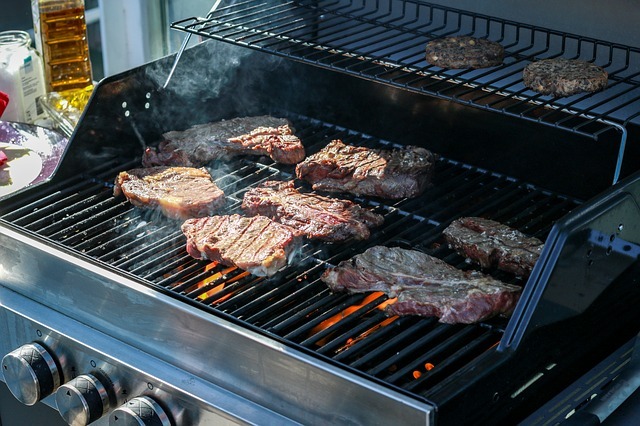 if you only visit on weekends, you’ll need to give it time to reheat every time you arrive. This is one of the top rated inflatable hot tubs on the market. It’s also set at a pretty fantastic price. Overall, it’s my number one pick, and I highly recommend checking it out! Intex is a brand well known in the inflatable pool world – and that’s because they make some seriously good quality inflatable pools, be they hot tubs like this, or some of the best above ground pools around. 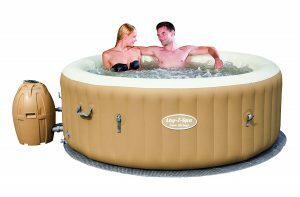 This particular inflatable hot tub is Intex’ PureSpa line, and this model includes the Bubble Massage feature, something you will seriously love! Reviewers claim it’s as lovely and powerful as jets! Not all inflatable hot tub systems can handle having the water heater and the bubbles run at the same time (bubbles cause heat loss), but this one totally can! So you can enjoy nice, hot, massaging bubbles for a nice long time! A built-in hard-water treatment system, which creates a more soothing experience, and leaving you soft water for your skin! 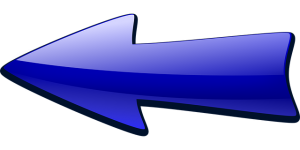 Inflation and set up will take you easily less than an hour! Intex even includes an instructional DVD and the inflation hose to make it stress free for you. If you want to go with a brand that does inflatable pools really well so you can be sure it’ll have everything just right, I’d go with an Intex. And this 4 person PureSpa model is a great choice for those of you love a long hot soak, and who want that Spa feeling right in their own backyard! Size, Inflated: 85″ dia, 28″ deep. This PureSpa 6 person tub is one of the larger options for those of you wanting a hot tub for more than 2 people. We think this bundle package is a fantastic way to get a top quality inflatable hot tub along with some bonus pieces that’ll make your experience all the better – all for a very good price. Intex inflatable pools are made of thick and durable fiber-tech construction, and when inflated are strong enough for you to easily sit on the edge if you just want to dip in your feet! Intex has lots of experience with inflatable pools, so they have figured out what works, and what doesn’t! This package comes with all you need for the hot tub experience! Replacement cartridges (it uses 2 easy-to-replace filter cartridges), a hard-water treatment system built right in, an inflation pump, thermal mat, cover, and some special extras: a matching inflatable bench that attaches for lounging or easy entrance, and a headrest, cup holder and seat that will make your relaxing top notch! With a simple touch of a button, you can activate the 140 bubble jets along the outer edge of the pool. Although apparently the bubbles do cool down the water (nearly every tub has this problem), this particular Intex PureSpa model solves the issue somewhat by heating up the air prior to pushing it through the bubble chambers. You’ll love the bubbles – they are such a relaxing, massaging part of hot tubbing! If you end up not loving this one, it’s good to know that there’s a 1 year limited warranty on it, so you can have peace of mind knowing you’re covered if something goes wrong. 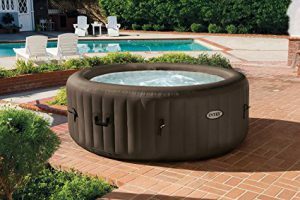 Although the price for this hot tub is a bit steeper than the others, this inflatable hot tub is pretty much the closest option to “the real thing” of all of the options on this list. This inflatable hot tub actually has JETS as opposed to bubbles. 4 high powered jets, that you can maneuver as desired, and set to either high or low strength! And as the jets only move the actual hot water through the system, your water stays much warmer using jets than bubbles. (Bubbles use air, which tends to cool your water more quickly). Like the idea of a salt-water sanitation system, as opposed to chemical filtration? If so, that’s another reason you’ll also want to look at this tub. Along with the hard-water treatment system that’s built in, the lack of chemicals will leave you with nice, soft skin after a relaxing soak! You can inflate and deflate this tub in less than 20 minutes with the included pump. That’s perfect if you want to either transport this hot tub with you on vacation or store it away for a season! This is currently the “Amazon’s Choice” product for “inflatable hot tubs and spas”, meaning you can be sure it’s both a good product, AND a good company to deal with over all. If you’re looking for a hot tub specifically to be used only by one or two people, one in which you can stretch out your legs nicely, this is the one for you! It’s nearly 9′ long oval shape will let you relax in comfort much like in a Jacuzzi tub – the optional bar across the middle is for holding your drinks if desired. This hot tub has an automatic start and stop, which is a fantastic feature for saving energy – but you’ll need to remember that it turns off if you let it be for more than 72 hours… it might not be the ideal inflatable tub for the cottage you visit only on weekends (heating up does take some time, like all tubs). You can set up this hot tub up indoors or outdoors, on decking or even on the lawn! You don’t need any tools or extras to get this tub pumped and ready to go… the pump in included and the tub can be set up in just minutes! You’ll get a set-up and maintenance guide DVD (which is always good for people new to pool maintenance), a tub cover, a filter cartridge, a pressure gauge and a chemical floater – all you need to keep your hot tub water clean and clear! The tub itself is made of durable Tri-Tech material, which prevents holes AND gives you a comfortable seat! There are 120 air jets all around the tub – you and the friend joining you in the tub will find yourselves relaxed and loving it! Overall, this is a good buy. It’s a unique shape will likely really appeal to some of you (and leave you more room on a small porch than a round one will). And the brand name and the high rating/reviews can help you be certain you’ll be happy with the quality! 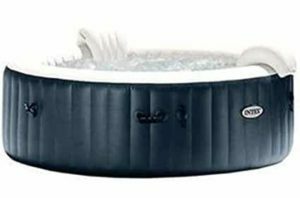 Intex makes the list again with this classy looking navy and white (also available in tan) inflatable tub that you can enjoy with up to 5 of your friends! 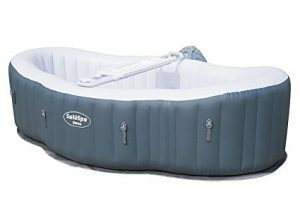 I think this tub is one of my personal favorites, as it’s large, sturdy, and built by a company that knows a thing or two about inflatable pools! Intex PureSpa tubs are make of thick, puncture-resistant Fiber-tech material. You’ll be able to feel how sturdy the tub is… when it’s properly inflated, you and your friends can EASILY perch on the outside, just dangling your feet in the tub! The floor of the tub, where you sit (unless you purchase seats) is comfortable and the perfect combination of soft & sturdy. You’ll also love that this tub also has a built-in hard-water treatment system. That along with the filtration system (easy-to-replace cartridges, 4 included with your purchase), will leave you with soft, clean skin after your relaxing soak! One of my favorite little extras that this pool comes with is the really cool underwater LED light that’s included for night time fun! You can select white or green, or switch it to a multi-colored varying light. Love it! There are 170 bubble jets that you’ll also love, coming out 360 degrees around the tub. While they are surprisingly strong, relaxing, and massaging, sending bubbles even up over your shoulders, don’t expect it to feel exactly like a jet in a full size hot tub. You unfortunately can’t angle them or choose a setting (high or low). Overall, the bubbles are very well received though! 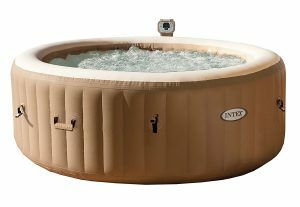 This inflatable hot tub by Intex comes with a 1 year manufacturers warranty, which should help you feel a bit better about making a purchase. This hot tub is actually the #1 Best Selling hot tub on Amazon this year. With an overall rating of 4 /5 stars by well over 1,000 reviewers, you can trust that it’s a good buy. It’s very simple to use, which is one of the reasons why this hot tub appeals to so many people, possibly yourself included. It has a simple touch-pad control system, an automatic on/off timer-control heating system, and is overall very easy to both inflate and deflate for storage (no tools needed). 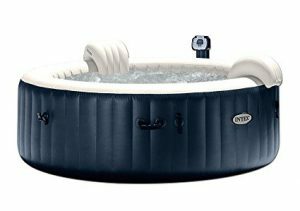 The walls of this inflatable spa tub are made of heavy duty Tri-Tech material, which you’ll appreciate for it’s soft feel (think leather) but also it’s sturdiness (it has a polyester mesh core encased in two layers of PVC). The floor of the tub actually is an air-cushioned base, which you’ll find means more insulation for the tub and more comfort for you when you’re sitting in it! One of the nice parts about the sturdiness of this tub is that when inflated, you (and friends!) can even just perch on the edge to dip your feet in – it won’t sink under your weight at all! This tub also has a “Rapid Heating System” – the tub heats 2-3 degrees F per hour. This might not seem like much, but it is significantly faster than most others (heating at 1-2 degrees F/hour) – you’ll love that! And if that’s not enough to sell you on it, Coleman also throws in a repair/patch kit (because let’s face it, life happens), the full filtration system, chemical floater, and more! It’s a FANTASTIC package for this price point! SaluSpa’s Miami was one of the first premium inflatable spas on the market, and it remains popular for good reason! The Miami tub can be set up indoors or outdoors in just a few minutes, meaning you’ll be ready to fill it up and let it heat before you know it! You’ll love that you can access the simple-to-use control panel from right where you’re sitting in the hot tub, and set the 120 air bubble jets going whenever you desire! The bubbles are strong, not quite as strong as jets, but apparently they still give you quite a fantastic massage and soothing experience! 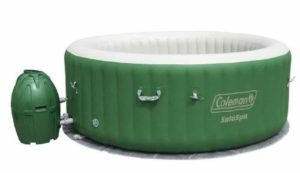 Note that this inflatable tub is slightly smaller than the others, coming in at just 71″ diameter when inflated (that’s the outside measurement) and 2″ lower than the usual 28″ deep. Although they suggest that it’s good for 2-4 adults, unless those adults don’t mind having their legs all entwined, you may want to plan on it being mainly for just 2 adults… just a tip. Even though it’s slightly smaller, it still has great water flow, pumping 350 gallons worth per hour. That’s pretty great! It has the “Rapid Heating” system (2-3 degrees F /hour) as well as a water filtration system built right in, which will get you nice hot, clean water when you want it! It comes with the proper chemical floater for the tub and the filtration system is noted as just the right size for this tub – which will save you a lot of headaches and discussions with “the Pool guy” at the local store. The tub is made of SaluSpa’s Tri-Tech material, which is an extremely durable and comfortable, puncture resistant material. 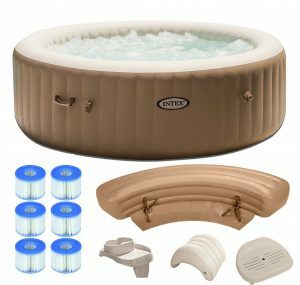 You get an instructional DVD that covers all set-up and maintenance… hot tubbing should be and will be a stress-free experience with this tub! All in all, this tub is a good choice for a single or a couple, someone who is looking for a decent tub made by a popular brand, at a surprisingly low price. This “Palm Springs” tub is very similar to the Miami we looked at above – a very popular tub, priced right, and with a decent overall rating by hundreds of customers. 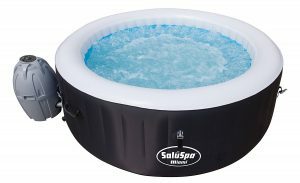 SaluSpa is a brand that knows it’s tubs, and knows that you want an easy set up – so this hot tub is designed for you to be able to inflate it and have it ready for adding water within just a few minutes, and with no tools required! Operating is easy! Just set the control panel to your desired temperature, press a button to activate the “Laz-Y-Spa Massage System”, and sit back and let the sensation carry you away! 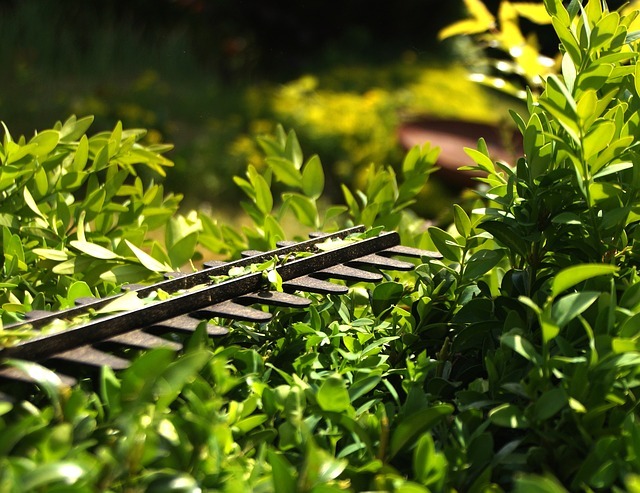 You can sit on the edge without fear of buckling or bending the sides because of the way it’s built (I-Beam construction). The floor has an air cushion base, insulating the tub so the water stays nice and hot for you. If you want a nice sized tub that has a great aerating bubbles system that feels like massaging jets, a tub that is easy to use, easy to inflate, and heats fairly quickly, we really think you’ll enjoy this tub! This tub is built really well! You won’t sink in if you perch on the edge and it can stand up to a lot of use & abuse – it’s Fiber-Tech material is very puncture-resistant yet comfortable for sitting on. There are 120 bubble jets running around the edge of the tub, which really do create a massaging spa experience! No, they aren’t jets that you can maneuver or adjust, but for the difference in price from a full permanent hot tub to this inflatable model, you’ll likely be thrilled with the strength of these bubbles. It comes in 2 different color options: Tan/White and Dark Brown/White. It has a built-in hard water treatment system – that and the filtration system together will ensure that your skin remains soft and comfortable after even a long tub soak. It comes with an insulated inflatable cover that has a safety lock so you can protect your children from climbing in without you AND keep the heat trapped inside until your next dip. Also included are a thermal ground cover, the filtration system with filters, a floating chemical dispenser, and a handy carrying bag that you can use for easy storage and transporting! This Massage Spa Set is currently Amazon’s #1 Best Seller for “Outdoor Hot Tubs”, so it’s definitely worth your taking a closer look! With over 1,500 reviews written on it and 1,000+ Q&A’s as well, you’ll be sure to find answers to ANY question you may have about it! The first thing you’ll need to determine is how many people you expect to be using this tub on a regular basis. There are always unexpected visitors that come and join you on occasion, but how many will use it on a regular basis? The tubs below all claim to be either meant for 2-4 or 4-6 people. Bear in mind that the max number assumes one of 2 things: 1) that if all adults, they won’t mind if their legs need to be touching in the center of the tub, or 2) that only 2 individuals are adults, the rest are children. While you may think bigger is better (and possibly more enjoyable as you can really stretch out), but remember that a bigger size means more water needs to be heated and then kept hot… meaning higher energy consumption and more time required to get the temperature to the max. Photo from Quora “What Is An Inflatable Hot Tub”? When it comes to comfort, unfortunately you can’t test out exactly how your body will feel in the tub when you purchase online. Thankfully, there are many detailed customer reviews (see “Take A Closer Look”) for each of these 10 products that affirm or give you advice on the comfort and quality of the tub itself, the floor of the tub, the jets or bubble jets, the heat, and more. Note: The 10 tubs were chosen based on their high customer ratings, and overall popularity – they are ALL considered comfortable, top quality tubs. You do want to get an inflatable hot tub that is from a brand that is known for making quality products. Coleman, SaluSpa, and Intex (the main brand names on this list) are all known to be excellent companies with notable quality service. 1) The Industry standard maximum heat you can get on ANY tub is 104 degrees F. All of the 10 hot tubs reviewed below reach the same maximum. 2) Inflatable hot tubs are unfortunately NOT meant for outdoor winter use – they just do not have the insulation required to keep the water hot enough. When outdoor temperatures drop to 40 degrees F and below, you should count on your tub needing to be drained and stored away so as to not risk freezing/cracking. This is the case for all 10 of these tubs, within a few degrees. 3) Although not mentioned specifically in every single review, all of these tubs generally do come with a thermal ground cover mat, a tub cover (often insulated/inflatable), everything you need for the inflating process, the filtration system with cartridges, and a chemical floater. You will only need to purchase the chemicals that YOU choose to use for keeping your water clean. Now that you have a general idea of what to look for, let’s get back up and look at the top picks for 2019. Enjoy Your Inflatable Hot Tub This Year! We know you’ll just love having one of these hot tubs in your backyard. 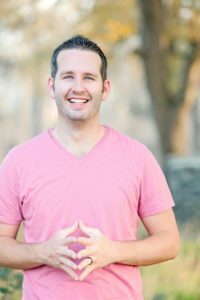 You’ll no doubt find yourself soaking away your aches and stresses more often then you anticipated! We hope you’ve found a hot tub that suits what you’re looking for here – which ever you end up choosing, we wish you much enjoyment! One last point… unfortunately, leaks DO happen with inflatable pools or tubs. See “How To Patch An Inflatable Pool” for tips on preventing your hot tub from leaks, and read how to patch them. As always, if you have any questions or feedback, let us know in the comments below! How do you deal with water treatment and contamination, I see there’s the external filters with each pool but do you need to put ion anything extra? chemicals? I know with the fiberglass pools you do, the inflatable is definitely a cheaper alternative, plus you can remove them when you don’t expect to be using it. Water treatment and contamination is actually a pretty big topic and difficult to answer fully here, but the quick answer is yes, you do need to put in sanitizers, oxidizers, and sometimes calcium too. 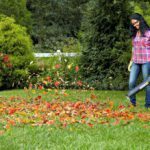 There are various options (bromine is a pretty popular alternative to chlorine, for example), but honestly, it will depend on your preferences and desires. You may prefer a salt water hot tub, for example. I recommend you talk to a pool or hot tub specialist to see which chemicals your family will like. For some extra reading, however, I found a good article about Inflatable Hot Tub Chemicals that summarizes it nicely. Excellent Round up on all the best Hot tubs of 2018! We have been looking for a hot tub for a while now. We really enjoy the Hot tubs in out hotels when travelling and really want to experience that at home. 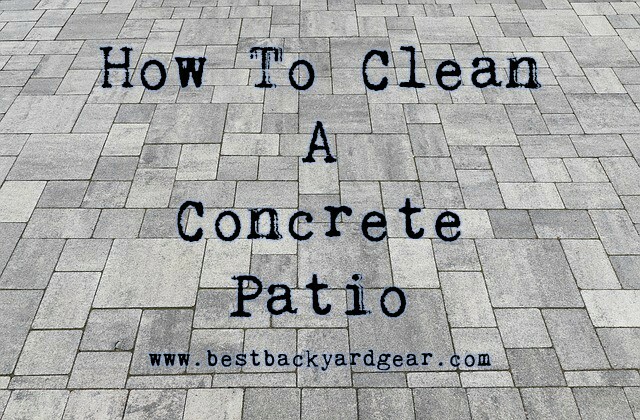 We especially want to enjoy it during the winter so we can still enjoy the outdoors even when it’s cold. Your round up has really helped us narrow down out search and we will be making our purchase very soon. We think the Lay Z Spa will be the best one to go for! After all all those amazon purchasers can’t be too wrong! Thanks for your comment, Steve! I personally feel good purchasing items that have lots of high reviews and comments as well. Feels like a safer purchase somehow. I hope you enjoy the winter ahead a bit more with an inflatable hot tub! Enjoy!